I just got home from seeing Grace Potter & the Nocturnals, Brett Dennen, and Sean Bones at Terminal 5 in New York City. Sean Bones opened strong enough. He played in a fairly unique pop-rock/ reggae style that successfully held my attention through a thirty minute set. He had a couple songs that were strong enough that I considered buying his CD, but ultimately decided that I probably wouldn’t listen to it. He’s really young, and pretty talented. If he can find a way to write songs that are a bit easier to distinguish from one another, he could do big things. Last thought on Mr. Bones… his bassist needs to chill-out with all of the hopping on one foot, it was seriously distracting. Brett Dennen played his brand of folksy pop/ acoustic pop for a little over an hour, and I found the experience rather painful. Brett’s albums never excited me, but I really was trying to give him a chance. As it turned out, the biggest problem with his performance wasn’t really his music, but his stage presence. There’s no reason to beat around the bush… Brett comes across as one strange dude. The six foot five, bare foot vocalist/ guitarist danced through his set in the most unbelievably awkward fashion. I couldn’t look at him without laughing, and I wasn’t alone. All six people in my immediate vicinity felt the same way. There was a lot of awkward gyrating. His band was really talented, but even during their solos Brett’s constant dancing detracted from their work. The second half of his set he lost the audience. The roar of side conversations overpowered the music. I won’t be seeing him again. Thirty seconds into their Grace Potter & the Nocturnals’ set, I completely forgot about the first two acts; they killed. Grace & Co. were my reason for going. I’ve been following them for about two years, and had high expectations. They annihilated my expectations by the third song. They are serious musicians, and they play in a number of different styles. Blues, rock, jam, and soul in any combination are all fair game for Grace and her band. Not only are they supremely talented, but Grace has an excellent stage presence, and is really easy on the eyes… come to think of it, no one minded the gyrating when she was on stage. They played a number of unreleased songs that will appear on their next album Medicine, due out in Spring 2010. Every song they played was good, but Oasis stood out in a major way. The duel guitar melodies in Oasis were incendiary, to steal a phrase from Almost Famous. Grace Potter & the Nocturnals are talented, inventive, and fun. I wish there were more emerging bands like that. The encore kicked off with Jefferson Airplane’s psychedelic anthem, White Rabbit. It was great, just like everything else they did, but the stage lighting was pretty trippy; props to the lighting guy. It was the strangest departure from a concert that I have ever had, and it served to illustrate the power of the performance. This show is pretty early in her touring schedule. If she will be coming through your area, I strongly recommend you see her. 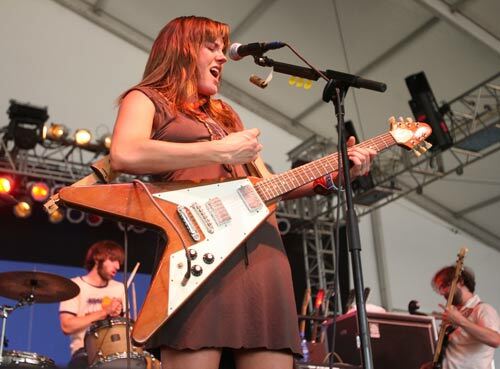 You can find Grace Potter & the Nocturnals’ albums and touring schedules on their website.